What’s New? Delicious Additions to Three’s Menu! Reopening our doors at Three’s after the kitchen fire in Fall was an epic feeling. And we were proud to reopen with some enhancements to not only the kitchen and decor, but also our menu! We gave a lot of thought to the food items we added, so we wanted to give you the lowdown on a few of the highlights. Three’s Seafood Crab Boil for Two, an entrée brought back from our first year in business. Three’s Seafood Crab Boil was on our menu the very first year when we first opened, and everyone really loved it. So we wanted to honor those earlier years and our first customers by bringing this entrée back. 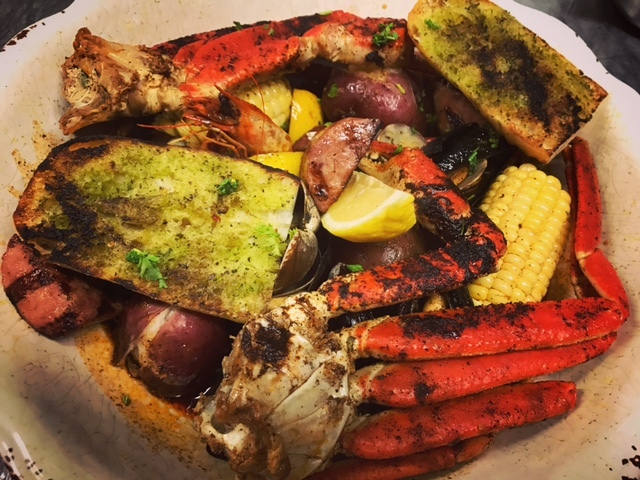 It’s enough to feed two people, with a generous mix of snow crab, Kaua’i prawns, clams, mussels, Portuguese sausage, potatoes and corn, all simmered in beer butter and our housemade cajun spice to give it just the right amount of flavor. Hawaiian Jambalaya, a longtime favorite at Three’s Bar & Grill, has returned to the menu. Our Hawaiian Jambalaya is another favorite making a second appearance from a few years back. 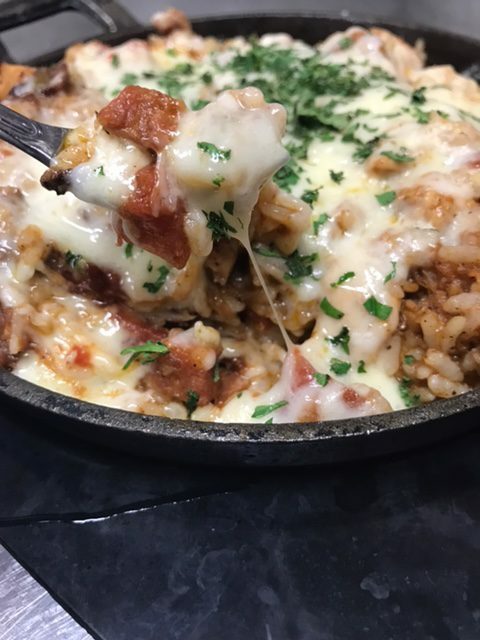 It’s a creole rice dish with a whole bunch of tasty ingredients, like shrimp, sausage, chicken, BBQ kalua pork, trinity peopers and melted jack cheese! Diners loved it and our staff was especially sad to see it taken off the menu. So this entrée is not only a customer pleaser, but pays tribute to our longstanding employees who loved this menu item and wanted it back. So here it is — come try it out! Ahi Sliders, one of Three’s new specialty items. A true newcomer to our menu, the Ahi sliders have been a mega hit! 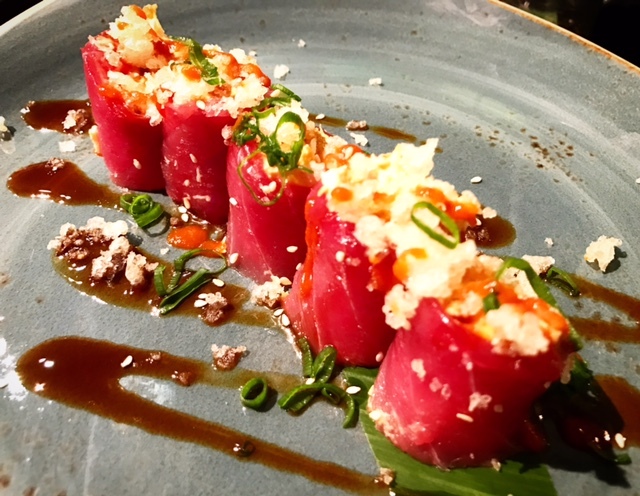 It’s a light, rice-free sushi dish, featuring spicy crab mix wrapped in Ahi sashimi, with tempura crunch, black tobiko and more. You’ll find the Ahi sliders under our Specialty Items, and we’ve gotten a lot of great feedback on it. Red Curry Clams & Mussels, a new appetizer at Three’s Bar & Grill. 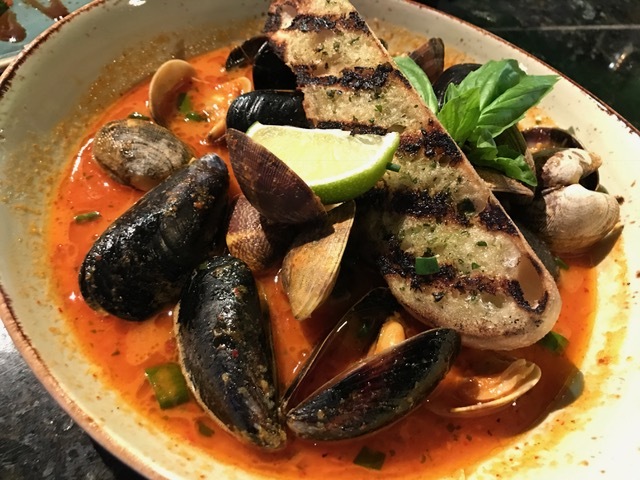 There’s more, like our Red Curry Clams & Mussels — a full pound of ‘em simmered in sake, red curry butter and Thai basil — in our Appetizer section. New specialty sushi at Three’s, known as the Marilyn Monroll. 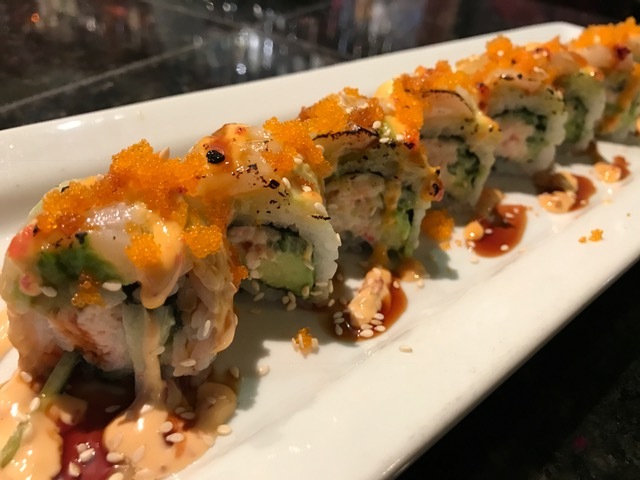 We also have more sushi selections, including the Marilyn Monroll, which is a spicy California roll topped with torched hotate and finished with unagi glaze, masago and goma. We’re stoked to add these items to the diverse menu Three’s is known for. Whether you’re in the mood for a Kalua pork quesadilla, tropical salad, french dip, ramen, beer can chicken, prime rib, freshly-shucked oysters or more than a dozen specialty sushi rolls, you’ll find it right here! We hope you’ll join us to try out one of our new additions, or enjoy an old favorite! Either way, we’re happy to have you. Three’s Bar & Grill is open from 8:30 a.m. to 10 p.m. Monday through Friday and open at 8 a.m. Saturday and Sunday (tried our epic breakfast yet?). We also have two happy hours a day, from 3 to 6 p.m. and 9 to 10 p.m. Give us a call at 808-879-3133 or book your reservation online at our page on Open Table. We’ll see you at Three’s!